Inspired by the Early Music pioneers, Robert learned to look for more than just the printed notes. He looks for a deeper connection with the music, the ideas behind that music and consequently with his audience. This year Robert’s most exciting moments were performing at the BBC Proms with Sir John Elliot Gardiner’s English Baroque Soloists, performing with his The Scroll Ensemble at the Concertgebouw Amsterdam and teaching improvisation at the Royal Conservatoire of The Hague. Find out more about Robert’s teaching here. Creativity is the starting point. As a founding member of The Scroll Ensemble he improvises inspired by historical practices: J. S. Bach and W. A. Mozart were famous improvisers. It’s the ensemble’s aim to recreate that adventure in the 21st century. From this historical perspective they go on to meet dancers, jazz musicians and story tellers in enrapturing performances. They performed for Queen Beatrix, were IYAP 2014 promising ensemble, were featured on national radio programme OPIUM op 4 and are finalists in the 2015 early music young artists competition in York (UK). Communication and new ideas in ensemble playing are also musical pillars. His orchestra Symphonie Atlantique performs classical and romantic music on historical instruments without a conductor. This historically common practice requires ultimate concentration and communication within the group and with the audience. For the orchestra’s second season in existence, it is already booked to play in the big hall of the Concertgebouw Amsterdam collaborating with the English countertenor Micheal Chance a.o. Robert thinks everyone would like to hear classical music and can often be found outside the concert hall: he improvised in a bar in Leipzig, lead people around Scheveningen with baroque improvisations, performed with a drawing robot in a gallery in Ghent (Belgium), can be seen in several films (Michiel de Ruyter, Erbarme Dich premiered at IRFF in January 2015) and played in theatre with a.o. Loes Luca and Karel de Rooij. 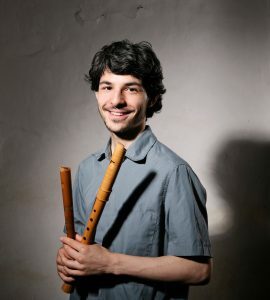 One of his own projects is his research into polyphonic wind instruments from all over the world. He composes his own music as well as having premiered over 30 new pieces written for his instruments. A.o. Jeremy Thurlow’s Ladder of the Escaping Eye (Director of Studies Robinson College, Cambridge). Robert was a soloist in the Concertgebouw Amsterdam (Albinoni concerto, Mozart arias and J.S. Bach’s Ich habe Genug), Cambridge Summer Music Festival (solo recitals), Concertgebouw de Doelen Rotterdam (recital), with Holland Baroque Society (Concerto for 2 oboes and bassoon (2013)) and The Wallfish Band (November 2013). He has been recorded several times for Dutch National Radio and TV broadcasts, WDR, NAXOS and ERATO (Diapason d’Or, BBC choice of the month). Robert also had the honour of working with Ton Koopman, L’Arpeggiata, Rachel Podger, AKAMUS, the OAE, Reinhard Goebel and many more. He was successful in several competitions: SONBU (NL, 2004, 1st prize), Prinses Christina Concours (NL, 2005), Telemann Wettbewerb (DE, 2009), Brugge competition and International Chamber music competition in Zory (PL, 2013, finalist). Robert taught at the conservatories of Den Haag, Rotterdam, Bydgoszcz, Katowice and Warszawa. In May 2015 he was on the jury for the international ORDA competition in Amsterdam. Robert started his education with Paul Leenhouts and Walter van Hauwe. He was then taught by Dorothea Winter, Daniel Bruggen and Frank de Bruine. Furthermore he regularly had lessons with Patrick Ayrton, Sebastian Marq, Reine-Marie Verhagen, Charles Toet and Alfredo Bernardini. Beside that he has followed masterclasses with eminent performers like Gerd Lunenburger, Antonio Politano, Simon Standage, Peter Kooij, Jill Feldmann, Michael Chance and many others. Always having had a keen interest in Theatresports, he finally started practising this bewildering art himself. He was also very honoured to have improvised on the piano with great actors like Amy Shostak, Joleen Ballendine and Ali Froggatt! Robert currently studies traverso with Emma Elkinson and in his free time learns Polish and Irish.